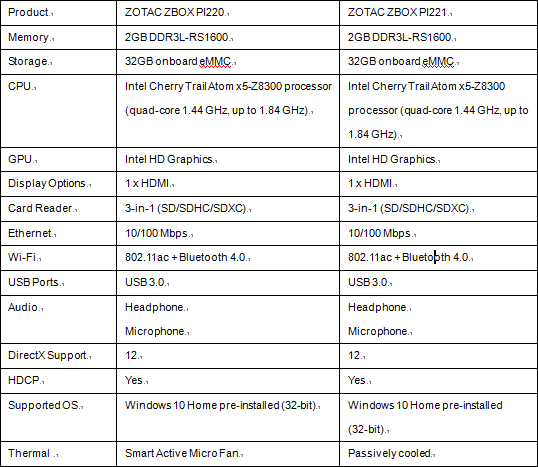 ZOTAC debuts Windows 10-powered stick PCs, the ZBOX PI220 and ZBOX PI221. ZOTAC International today introduce the dongle sized Mini PC, the ZOTAC PC Stick. Joining the lineup of pocket-sized PICO solutions, the PC Stick comes in two ready-to-go solutions: ZBOX PI220 and the award winning ZBOX PI221. The PI220 and PI221 pack the functionality of a full size PC in the form of a stick. Equipped with Intel's 14nm Cherry Trail quad core processor, performance and power efficiency are improved over previous generation processors. The PI220 and PI221 deliver the same network performance as users would expect from a full size PC. Both models come with 802.11ac WiFi capability with external antenna and a full size Ethernet port for an always-on connection. Bluetooth 4.0 also comes standard. ZOTAC also introduced the high speed USB 3.0 to the tiniest computing solution. Both PI220 and PI221 are equipped with a USB 3.0 port, so users can expand storage space or connect peripherals to augment the PC's functionality on the go. Micro SD/SDHC/SDXC memory card slot is also a standard feature for quick data transfer or easy storage expansion. The PI220 and PI221 are complete systems ready to go with pre-installed memory, storage and Windows 10 OS. The PI220 is an energy-sipping unit that is whisper quiet with a smart active micro fan, and the PI221 enables silent operation with a passively cooled solution and zero moving parts. 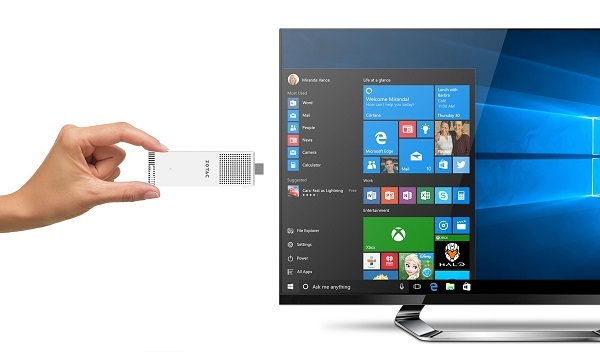 Both models deliver desktop performance in a pocket-able form, and bundled with an HDMI extension cable for flexible connections. The ZOTAC ZBOX PI220 and the PI221 will be displayed at the upcoming Taiwan Computex 2016.